Insulated Concrete Form Market size is estimated to surpass USD 1.6 billion by 2025; according to a new research report by Global Market Insights, Inc.
Increasing consumer awareness pertaining to high energy bills and necessity for resilient and energy efficient building techniques has stimulated the insulated concrete form market. Strong applications outlook across the industrial, infrastructure, residential as well as commercial buildings will support product demand. As per the National Association of Home Builders (NAHB), the houses build by ICF walls and roof can result in 8% to 19% energy savings, compared to the traditional wooden frame constructions. Government initiatives for reducing the carbon emissions with favorable policies and incentive-based schemes promoting the use of energy efficient materials in the building construction will surge the demand for ICF in coming years. For instance, in November 2018, the BRE Group and the U.S. Green Building Council (USGBC) announced a partnership to work on developing strategies & solutions for promoting green building performance. Key benefits including lower insurance rates, quieter interiors, faster construction times, durability and energy efficiency are shifting the preference towards the construction of the houses using the ICF system. Furthermore, manufacturers are investing in new product development that offers higher durability and superior thermal resistance compared to the wood-based construction, this would further increase the industry expansion. Rising occurrence of earthquakes, tsunami, floods, heatwave, hurricanes etc. across the tropical, subtropical and coastal environments has resulted in an increase in the construction of ICF based homes. 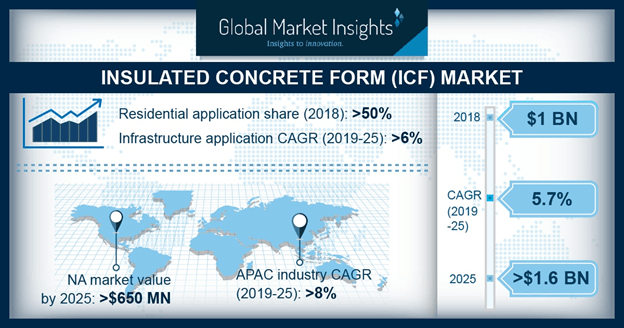 Strong growth in the construction industry to accommodate the increasing urban population is supporting the insulated concrete forms market advancement. The global construction sector is projected to cross USD 12 trillion by 2020, at over 3% CAGR. Countries including China, the U.S., and India are expected to dominate the global construction industry. Also, ICF can reduce the time for construction, thereby reducing labor costs. However, the product penetration is higher in developed countries of North America and Europe. Polystyrene foam holds a substantial share in the global ICF market, accounting for over USD 700 million in 2018. Polystyrene foam includes expanded polystyrene (EPS) and extruded polystyrene (XPS). Key aspects such as lightweight, higher impact resistance, and excellent thermal insulation will drive the polystyrene-based ICF demand. The product finds increasing application in building walls, floors, and building roofs. Superior fire resistance properties along with higher strength will generate new growth opportunities up to 2025. Global ICF market from the commercial application will witness significant gains at over 6% from 2019 to 2025. Economic growth in developing countries, favorable FDI policies on commercial construction, and enhanced focus on energy conservation will surge the product demand. Growing government investments in infrastructural and hospitality sector will provide an impetus to the industry development. Proliferating population in the Asia Pacific region along with rapid development in industrial and infrastructural construction will support the business growth in the region. Asia Pacific and Latin America are the fastest growing commercial construction sector, majorly driven by China, India, Indonesia and Brazil. North America dominates the global ICF market with over 35% of the industry share in 2018. Stringent regulations along with the positive influence of organizations such as USGBC is driving the product usage. Residential applications hold a substantial share in North America ICF market, however, increasing popularity for ICF in commercial projects including hotels, educational institutions, hospitals, retail outlets, and multi-story buildings will drive the industry share. According to the U.S. Census Bureau, the total spending on commercial construction has significantly increased from USD 40 Billion in 2010 to USD 89.5 Billion in 2018. The global ICF market share in highly competitive with a large presence of multinational and regional players from North America and Europe. The major players include Quad-Lock Building Systems Ltd., Airlite (Fox Blocks), IntegraSpec ICF, Nudura Corporation, Logix Insulated Concrete Forms Ltd., Superform Products Ltd., BuildBlock Building Systems, Amvic and Plasti-Fab. New product developments, strategic mergers & acquisitions, and expansion of distribution network are among the key strategic observed in the industry. For instance, in July 2018, Logix Insulated Concrete Forms Ltd. announced to launch its new product range, Logix XP-1 for wall applications to enhance its industry share.